DETROIT: Corvette Racing’s second-generation C6.R will be powered by a new 5.5L production-based V-8, to compete in the new unified GT class in the 2010 American Le Mans Series as well as the GT2 class at the 24 Hours of Le Mans. The updated C6.R and the Corvette ZR1 on which it’s based represent the strongest link yet between a production Corvette and the modern Corvette Racing team. Both cars are well-equipped to compete on and off the track with showroom competitors including Aston Martins, BMWs, Porsches, and Ferraris. 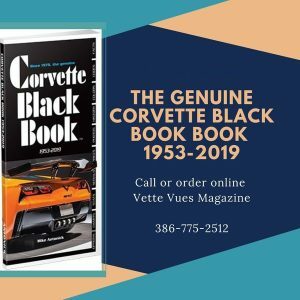 Corvette has a long history of production-based endurance racing, making its first appearance at the 12 Hours of Sebring in 1956, and its first appearance at Le Mans in 1960. Then Corvette chief engineer Zora Arkus-Duntov leveraged the racing program to improve the production Corvette, as evidenced by the development of heavy-duty and high-performance components and the introduction of the race-bred Z06 option on the 1963 Corvette Sting Ray. 2010 Corvette Racing’s second-generation C6.R will be powered by a new 5.5L production-based V-8, to compete in the new unified GT class in the 2010 American Le Mans Series as well as the GT2 class at the 24 Hours of Le Mans. Corvette Racing campaigned the C5-R from 1999 through the end of the 2004 season. 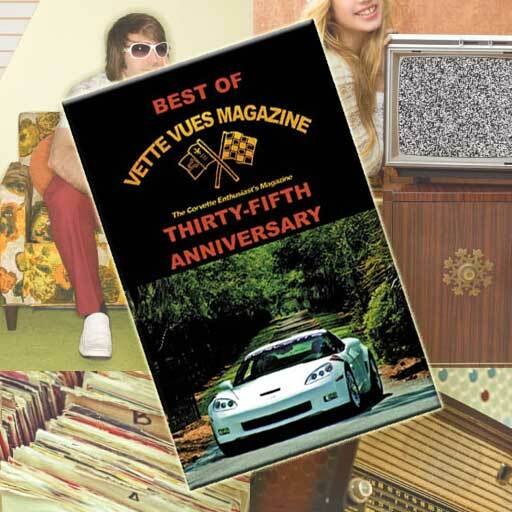 The first-generation car scored 35 victories in 55 races, won its class at the 12 Hours of Sebring three consecutive years, posted three 1-2 finishes in the GTS class at the 24 Hours of Le Mans, and earned four consecutive ALMS manufacturers championships for Chevrolet. It also served as a catalyst for Corvette performance. In 1999, the fifth-generation Corvette C5 produced 345 horsepower from its 5.7L V-8. Leveraging the powertrain technologies developed for the C5R, Corvette brought back the hallowed Z06 moniker in 2001, packing a 385 horsepower 5.7L V-8. 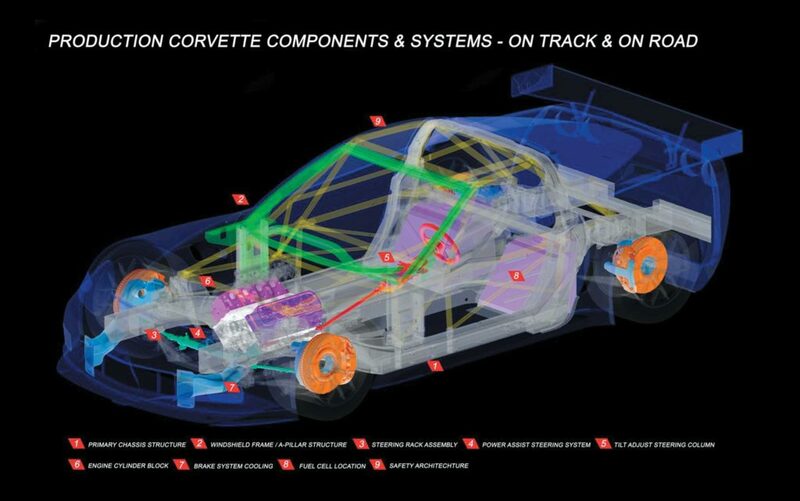 2010 Production Corvette Components and Systems – on Track and on the Road. In addition, the C5-R helped shape the sixth-generation Corvette, introduced for the 2005 model year. Corvette Racing’s influence could be seen in the C6 Corvette design, which featured flush headlights for better aerodynamics; a single, large grille opening for the engine air intake, radiator, and brake cooling; a lower coefficient of drag; and low 3,179-pound curb weight. Lessons from racing were also integrated in the 6.0L LS2 V-8, the most powerful standard Corvette engine to date, with 400 horsepower and 400 lb-ft of torque. As a result, the C6 Corvette delivered unprecedented performance, including a 186-mph top speed, acceleration from 0-60 mph in 4.1 seconds, and quarter-mile runs in 12.6 seconds at 114 mph. The C6 Corvette served as a foundation for the joint development of two new, high-performance Corvettes: the 2006 Corvette Z06 and the Corvette Racing C6.R, introduced in 2005. Both cars were powered by 7.0L small-block V-8 engines, with dry-sump lubrication systems, CNC-ported aluminum cylinder heads, titanium valves, forged steel crankshafts, and plate-honed cylinder bores. For the Z06, the collaboration translated into 505hp, 470 lb.-ft. of torque, and searing performance: 198-mph top speed, acceleration from 0 – 60 mph in 3.7 seconds, and quarter-mile runs in 11.7 seconds at 125 mph. Racing’s influence was also evident in the Corvette Z06 use of lightweight carbon fiber front fenders and wheelhouses, and aerodynamics package – including a front splitter, air extractors behind the front wheels, radiused trailing edges on the wheel openings, brake cooling scoops, widened rear fenders, rear diffuser, and spoiler. For the C6.R, homologation on the Z06 translated into 42 wins, four consecutive ALMS drivers, and manufacturers championships, and three victories at the 24 Hours of Le Mans. In the 2010 American Le Mans Series, Corvette Racing will compete in the series’ production-based GT category (formerly GT2) and in the GT2 class at the 24 Hours of Le Mans with a second-generation C6.R that is homologated on the Corvette ZR1. The GT rules require the use of many production-based components, making the ZR1 and C6.R the closest street and racing Corvettes since the 1960s. Introduced for the 2009 model year, the ZR1 is the fastest, most powerful car ever produced by Chevrolet. To deliver 638 hp, the LS9 V-8 engines are hand-built using many of the processes developed by the race team. To deliver a 205-mph top speed, the ZR1 aerodynamics package also utilizes race technology – including wide carbon fiber front fenders with dual vents, a full-width rear spoiler, and a front splitter. The updated C6.R utilizes the ZR1 body design, aerodynamic package, aluminum frame and chassis structure, steering system, windshield, and other components. Aluminum frame: The new Corvette C6.R is built on the same aluminum frame rails that underpin production Corvette Z06 and ZR1 models. Other production chassis structures in the race car include the windshield frame, the hoop around the rear of the passenger compartment, the door hinge pillars, the drivetrain tunnel, the firewall, and the floor pan. Steering system: The new Corvette C6.R utilizes the production steering column out of the ZR1, with a fully adjustable steering wheel, and production rack-and-pinion steering rack. 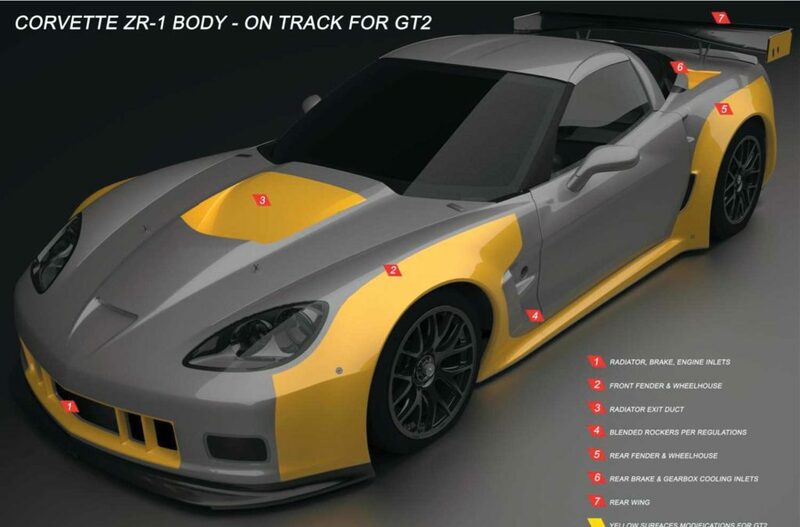 Body profile: The Corvette C6.R race car is now virtually identical to the Corvette ZR1 street car in appearance, as GT rules require production-type fenders with simple flares to accommodate wider tires. Aerodynamics: The new C6.R utilizes the full-width, production rear spoiler from the ZR1, and a production-based ZR1 front splitter that extends 25mm, in contrast to the 80mm splitter allowed under the GT1 rules. Although the aerodynamics package does not produce the same levels of downforce as the GT1 car, the C6.R is more predictable over a wide range of speeds. 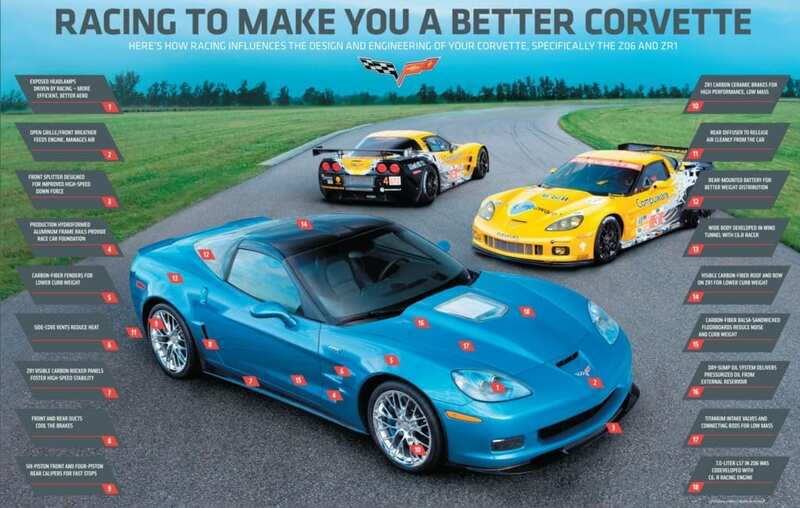 Where the C6.R and ZR1 differ significantly are in situations where GT rules actually prohibited the use of the more sophisticated ZR1 components. For example, the ZR1 is equipped with carbon-composite brake rotors, while GT regulations require ferrous (steel) brake discs. And, where the ZR1 utilizes a 6.2L, supercharged V-8, the C6.R will use a naturally aspirated small-block, production-based 5.5L V-8. The Corvette C6.R race cars’ 5.5-liter Chevrolet small-block V8s are developed, built and maintained by GM. The Corvette C6.Rs’ LS5.5R is a naturally aspirated race engine, based on the Corvette Z06’s 7.0-liter LS7 engine (which in turn was developed with the 7.0L race engine used in the C6.R GT1 cars), built on production cast-aluminum cylinder blocks. Pending GT2 class regulations specify a maximum displacement of 5.5 liters, the reduction in displacement to meet this requirement was achieved by shortening the crankshaft stroke and reducing the cylinder bore diameter. In accordance with the regulations, the race engines have two 28.8mm diameter intake air restrictors. The LS5.5R engines are equipped with dry-sump oiling systems, CNC-ported aluminum cylinder heads with titanium intake and exhaust valves, and sequential electronic port fuel injection. The race engines use E85R ethanol racing fuel in the ALMS and E10 fuel in Le Mans. 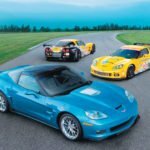 Clearly, Corvette Racing’s success in production-based endurance racing has played a significant role in improving the performance of the production Corvette. 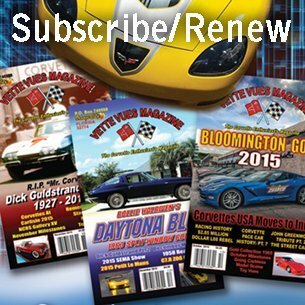 In addition, as the racing and production cars have become more closely linked, Corvette Racing has also shown a positive impact in Corvette sales. 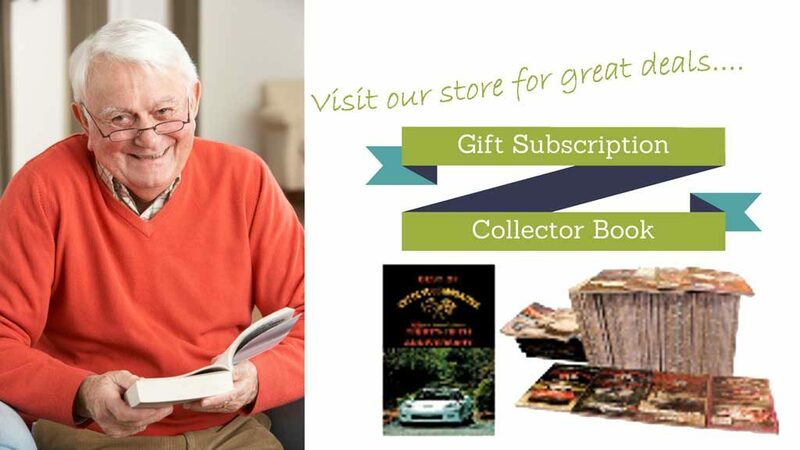 Check out our store for great ideas for Corvette Gifts and subscriptions. Tags: 2010 American Le Mans Series, 2010 Corvette ZR-1, 2010 Corvette ZR-1 and Corvette Racing C6.R Specificiations, 2010 GT2 Corvette C6.R, 24 Hours of Le Mans, GT2 class	.